Alright. I just got an eye roll from my youngest son. Probably deserved. Note to self, stop having my kids proof read my writing attempts. 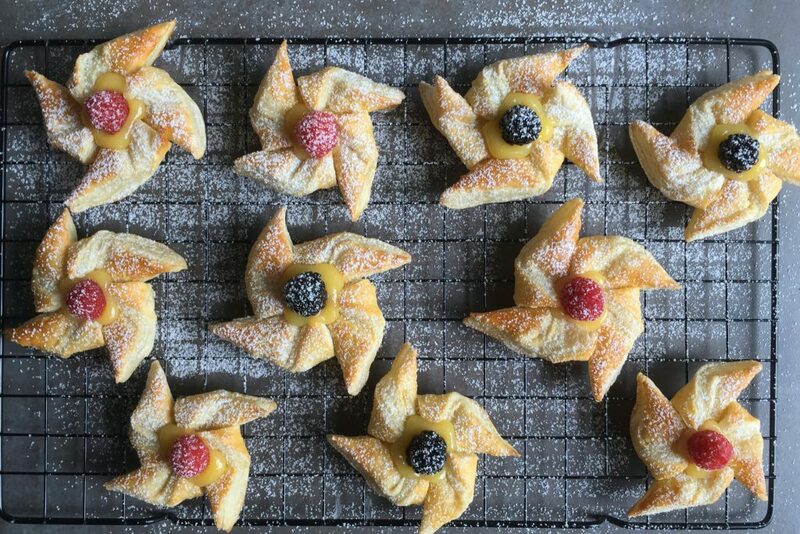 The thing is, these pastry pinwheels really are easy to make and are quite fantastic. Perfect little pastry for a brunch, luncheons, bridal showers or even your next fancy soiree. 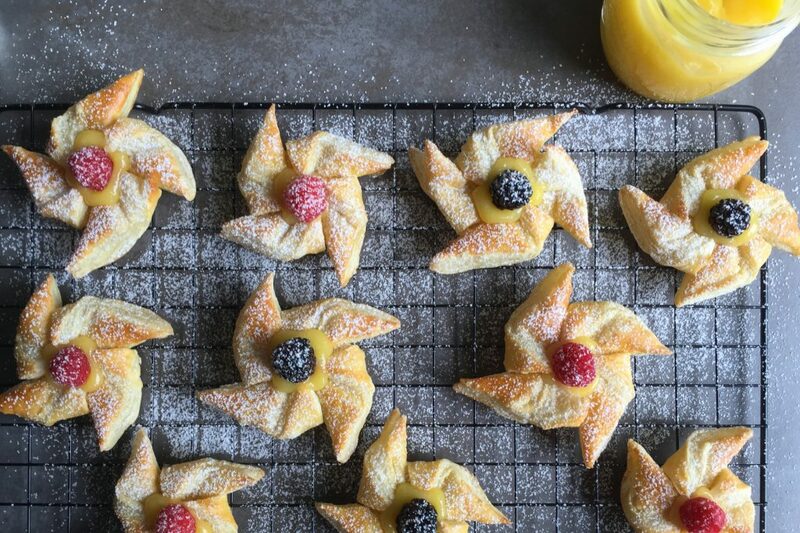 You do have to form pinwheels with the pastry. There is no getting around that, as the cuteness factor of these adorable pastry tarts depend on it. But I promise you, this is not hard to do. Look at the step by step photos below. After you make a few, you will crank them out like a pro. I did make the lemon curd from scratch. It actually is easy to make and you could make it the day before. That said, they also sell good lemon curd at the grocery store (in the jam section). It will be fine. So to recap. 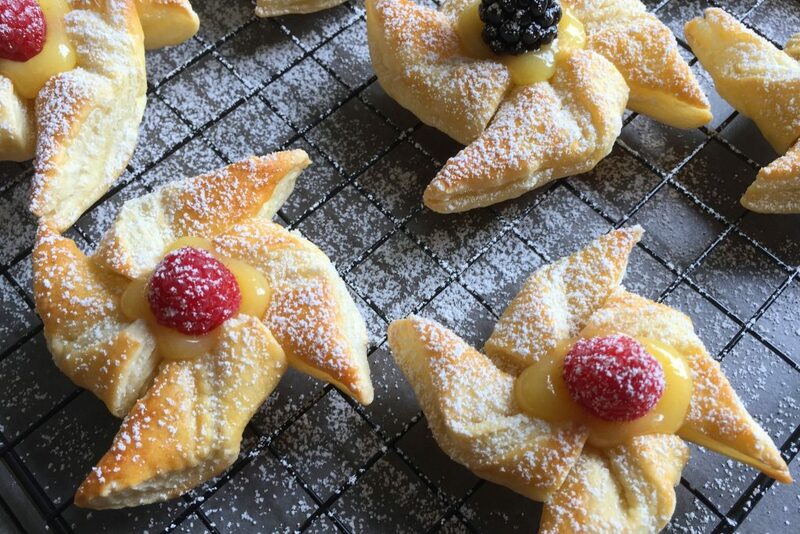 You need puffed pastry sheets, lemon curd, fresh berries and some powdered sugar to sprinkle. Done. Life is good. 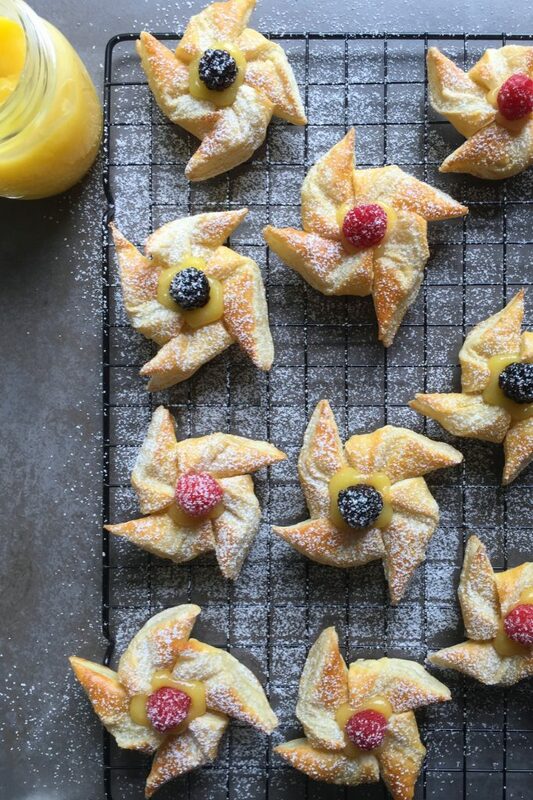 How to make pastry pinwheels. Prepare the egg wash. Crack the egg into a small bowl. Add a teaspoon of water and whisk until combined. Take out the first batch of pastry. Place a little bowl of cold water nearby. Dip your finger in the water and then dab the center of a pastry square to slightly moisten. Take half of the corner of one of the squares and bring it up and over and press the tip into the center. Do the same thing to the opposite half corner. Turn the square and do the same fold to the remaining 2 corners. It should now look like a pinwheel. Repeat with remaining squares. I know it's confusing. Look at the photos. 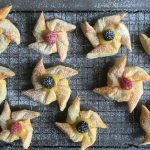 Lightly brush the top of each pastry with some egg wash. Place the 9 pastry pinwheels on to a sheet pan lined with parchment paper. Place at least two inches apart. Refrigerate again if needed. Bake the pastry tarts for about 15 minutes or until puffed up and golden brown. Cool for one minute then using the handle end of a wooden spoon, press down on the center of the tart, to create a space for your filling. Finish cooling the tarts on a cooling rack. While the first batch is baking, you can be working on your second batch. If you only have one sheet pan, make sure you wait until it is completely cool before placing the second batch of cold pastry on it. 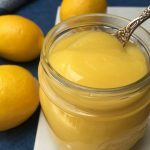 Take a small spoon and fill the centers with a small dollop of lemon curd. Place a berry on top. 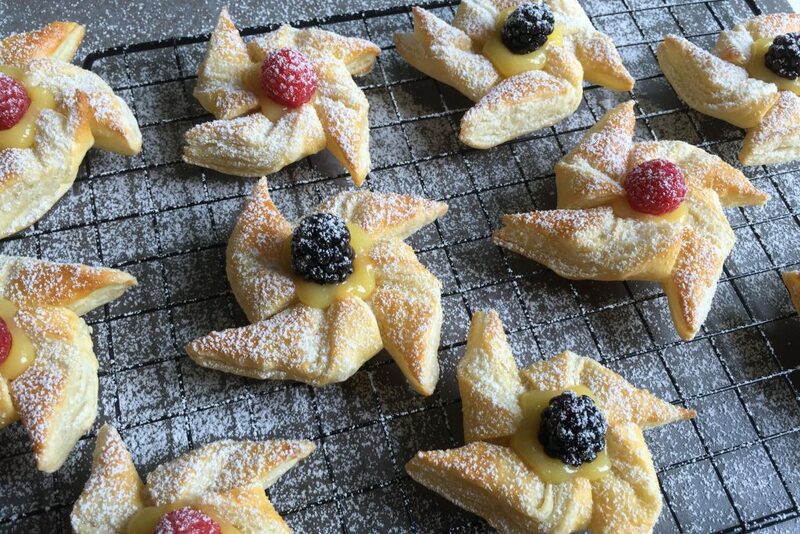 When finished with all of the pastry pinwheel tarts, sift a bit of confectionery sugar over the tops. Cover and refrigerate until ready to serve. No rolling pin? Just use the original 9" x 9" size of the pastry sheet. The squares of puffed pastry may not end up exactly the same size. It's fine. It is important to keep puffed pastry cold. Sometimes I stick in the freezer for a few minutes before moving on to the next step. When checking to see if they are done, lift one up with spatula and make sure the bottom looks golden brown. The egg wash sometimes brown the tops prematurely. You could substitute your favorite jam for the lemon curd.